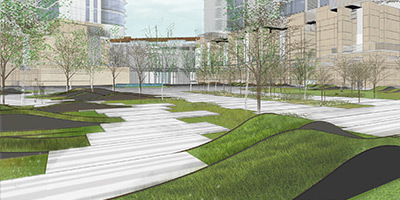 The large recreation complex and urban resort fronting an urban parkscape also designed by our studio contains a plethora of programs for guests and members alike. Apart from its hotel facility, the premise houses a series of dining restaurants, banquet halls, wedding chapel and bars with a full fledged sports wing including an indoor pool, gymnasium and spa. We are tasked to integrate and conceptualize the arrival experiences, pavilions, courtyards and rooftop gardens whilst echoing the aesthetics of the architecture and interiors. A residential landscape language echoing a minimalist yacht aesthetic and rolling hills opposite its shores. 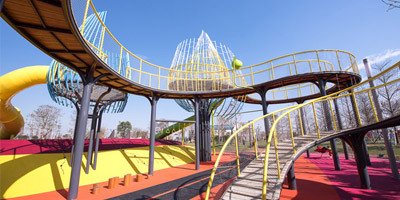 A landmark park abstracting the famous 'Bird Paradise' as an overiding theme to create a new playscape where ecology and urbanity coexists.